Also known as the bogsucker, timberdoodle, hookumpeke, and night peck, the American woodcock is a stubby softball-sized bird with rounded wings, a long bill, and a short neck and tail. The only shorebird that inhabits the forest floor, it is typically found on moist woodland floors and the edges of brushy marshes and fields, where it nests and feeds. It hunts its favorite prey, earthworms, by thumping its feet on the ground, presumably to agitate the worms, then plunging its bill to the nostrils in the leaf litter. A breeding summer resident of Minnesota, the American woodcock nests throughout most of the state, except the prairie, which lacks suitable habitat. Breeding in loose colonies, the woodcock raises one annual brood of 4 eggs. Hatching after 20-21 days, the young first fly at 14 days and are independent after 42-56 days. They usually live for 2 years, but may survive as long as 8. It flies north through the state between March and April. The males’ mating displays are among the most entertaining among all birds, and are most commonly observed in April. The male woodcock struts around the perimeter of his dancing ground, and then suddenly takes to the air, his wings producing a distinctive twittering as he soars as high as 300 feet, then zigzags back to the dancing ground in dramatic swoops. Their southern migration peaks in October and November. They winter from east Oklahoma and south Missouri to Texas, the Gulf Coast, and south Florida. Although American woodcock populations are globally secure with an estimated 5 million individuals in 2001, populations have declined by one-third in North America over the past 5 decades. Numbers have been mostly stable in Minnesota, but population trends are may be unreliable because of low detection rates. 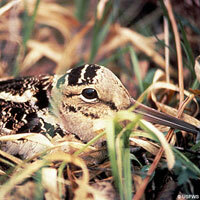 They are a Species of Greatest Conservation Need in Minnesota because they rely on increasingly threatened habitat. Urbanization, agricultural development, and the draining and filling of wetlands directly degrade and destroy its breeding grounds. Additionally, many of the early succession forests that it prefers are maturing, changing the forest structure on which it relies.